2017 has brought some expected and some unforeseen challenges, but with pragmatism and purpose, we’ve persisted in keeping the Northwest wild. Looking ahead, there’s so much more work yet to be done. Please consider giving a year-end gift today. 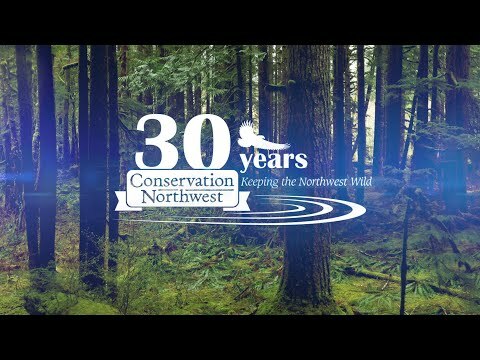 Annual Conservation Northwest memberships begin at only $35! January: Our Citizen Wildlife Monitoring Project volunteers snowshoe into a backcountry remote camera site in the North Cascades near Leavenworth to find amazing photos of a gray wolf! This collared female wolf is later determined to be from the Teanaway Pack. February: With partners, we debut a new short film Time for the Grizzly? with award-winning filmmaker Chris Morgan, exploring how grizzly bear restoration would work in the North Cascades, and how it’s been successful in Montana and other areas through community input. Film screenings and other events help build momentum for upcoming public comment opportunities. March: We secured a court order ensuring that Okanogan County considers social and environmental factors when designating county roads for off-road vehicle (ORV) and all-terrain vehicle (ATV) use. The County had previously and unilaterally opened up all county roads with lower speed limits, regardless of risk to public safety or wildlife habitat. March: Annual counts confirmed that Washington is now home to more than 115 wolves in more than 20 wolf packs. We worked hard to support their sustained recovery, including working with local communities to build social tolerance for wolves and other carnivores. March: During a National Park Service and U.S. Fish and Wildlife Service comment period, we organized supportive comments for North Cascades grizzly bear restoration. We also coordinated Op-Eds, LTEs, video testimonials, meeting attendees and other supportive actions. April: In its 10th year, our Citizen Wildlife Monitoring Project completed a season report including highlights from our 82+ volunteers, 27 survey areas in Washington and B.C., and more than 4,850 volunteer hours. All of it supporting local research on rare and recovering wildlife in the Pacific Northwest. April: We begin work on our new Sagelands Heritage Program in central Washington, including participation in the Arid Lands Initiative. April: Our forest restoration and road rehabilitation work in Okanogan County helps restore habitat and protect fish spawning streams from harmful sediment. May: The 2016-2017 project season of our fisher reintroduction project was the most successful yet, with 46 fishers released into Mount Rainier National Park and surrounding national forest lands to help restore the population in the South Cascades. May: Even as grizzly bear restoration work in the North Cascades slowed down after the last public comment period, we forged ahead in British Columbia with our Coast to Cascades Grizzly Bear Initiative, including securing resolutions supportive of grizzly bear recovery from cities and tribal nations, hosting a symposium of First Nations and conservation leaders, and working with cattle ranchers to prevent conflicts. June: Thanks to our fisher reintroduction project with the National Park Service and Washington Department of Fish and Wildlife, trail cameras confirmed the first evidence of fishers born in the Cascade Mountains in nearly a century. June: Working with local ranchers and scientists, we helped host a Low-Stress Livestock Handling clinic in northeast Washington. These methods help ranchers be more effective, limit damage to natural areas, and can reduce conflicts with predators. June: We hosted the world premiere of the documentary Last Stand: The Vanishing Caribou Rainforest with full house at the Mountaineers Program Center in Seattle to raise awareness about mountain caribou. August: Over the past year, we worked with scientists and First Nations in Washington and southern British Columbia to reduce Canada lynx mortality and research the movement of these rare felines. August: When national monuments were “under review” by the Trump Administration, we spoke loudly to protect Hanford Reach and other national monuments. August: We relaunched I-90 Wildlife Watch, an effort with state, federal and university partners to document wildlife on the move in the Snoqualmie Pass Corridor. September: Our Executive Director Mitch Friedman authored an opinion editorial for High Country News and other outlets underscoring the importance of collaboration for long-term wolf recovery and durable conservation progress. October: After months of work with the Washington Department of Natural Resources (DNR) and other forestry, conservation and recreation stakeholders, we celebrated the release of a new 20-year forest health plan intended to restore and sustainably manage Washington’s state forests. Our Science and Conservation Director Dave Werntz will formally advise work done under this plan as a representative on DNR’s citizen advisory committee. October: Trail cameras operated by our Citizen Wildlife Monitoring Project volunteers captured images of not one, but TWO wolverines together at a site in the North Cascades near Lake Chelan. Images like this help inform our conservation work for this iconic species and that of partner agencies and scientists. October: In its third year of operation, the Working for Wildlife Initiative, led by the National Fish and Wildlife Foundation and coordinated by Conservation Northwest, made progress to protect wildlife habitat, working lands and natural heritage in the diverse landscape of the Okanogan Valley and Kettle River Mountain Range. November: While permanent protection isn’t assured until the state’s Capital Budget is finalized, logging in the core of Blanchard State Forest around Oyster Dome is on hold. November: Along with a dozen partners and together representing hundreds of thousands of Washingtonians, we strongly supported an administrative withdrawal in the Methow Headwaters to protect this incredible wild place, its wildlife, and local communities from proposed industrial-scale copper mining. November: We rolled out a new modern and mobile-friendly website to share our work keeping the Northwest wild! December: When news broke that two wolves had been illegally killed in northeast Washington, we immediately put up a $10,000 reward for information that brings these poachers to justice. We’re also working on-the-ground in rural communities to promote tolerance for wolves through our Range Rider Pilot Project and other efforts. December: Through the new Washington Public Lands Defense Network and partnerships with national allies, we stood strong to protect our public lands in Washington and beyond. Remember: none of these accomplishments could be done without YOU! Your support makes our work keeping the Northwest wild possible. Help us kick off the New Year with determination by making a year-end gift that will allow us to continue our vital work protecting old-growth forests and other wildlands, connecting large landscapes and vital habitats, and restoring native wildlife from the Washington Coast to the British Columbia Rockies. Please donate today! Thank you for your support. Or view our accomplishments in 2016.